The NOD/SCID mouse system is a powerful tool to assess true stem cell number and functional behavior. Although in vitro assays such as Colony Forming Cell (CFC) assays are extremely useful in enumerating and analyzing hematopoietic and non-hematopoietic progenitors, the only test for true stem cells is their ability to reconstitute the entire blood forming system of an ablated host. 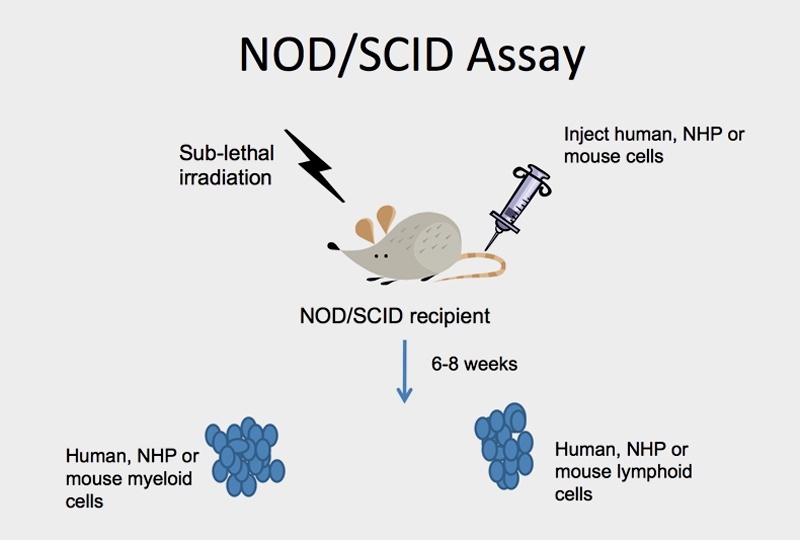 The NOD/SCID mouse is an immunodeficient recipient, which allows the introduction of human, NHP or mouse cells and the determination of stem cell functionality through engraftment, proliferation and differentiation into at least two distinct lineages (typically myeloid and lymphoid). This in vivo reconstitution assay is typically known as the Competitive Repopulating Unit (CRU) or SCID Repopulating Cell (SRC) assay. Quantify true stem cell numbers in test and control samples of human, NHP and mouse samples. Determine the effect of test compounds on the engraftment potential of human stem cells. Evaluate efficacy of stem cell expansion protocols by quantifying functional stem cell numbers in expanded cell populations. Evaluate efficacy of stem cell mobilizers by assessing stem cell content in blood from mobilized human or NHP models. Please CONTACT US to speak with a scientist today.